Banquet tables form a catwalk for the performers, bringing the action up close and personal, making the experience even more spectacular than, perhaps it would be otherwise. You'll have performers above you and around you, keeping you on your toes and excited throughout the show. You will be forgiven if you find yourself open mouthed at the entertainment that surrounds you. 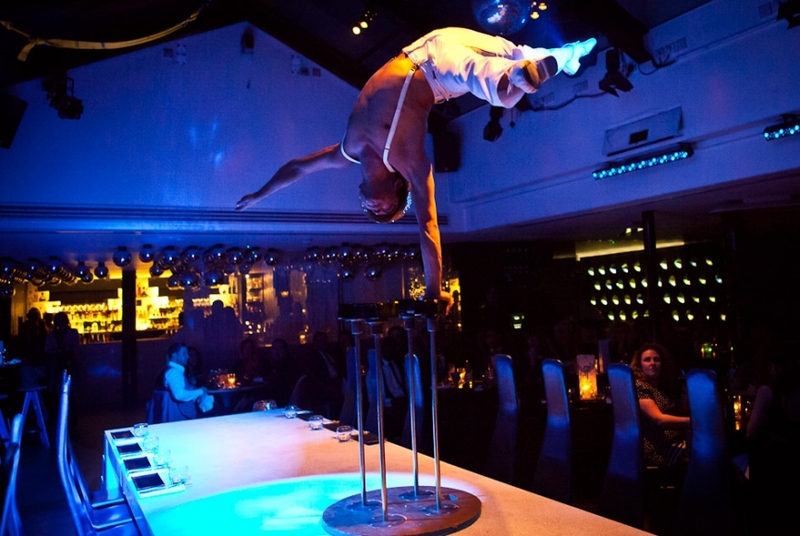 Once you've managed to turn your attention away from the Circus theme, you'll find yourself greeted by a delicious menu of Asian food, including sushi, Chilean sea bass with chilli, truffle, sashimi, dim sum, miso black cod and much more. The options are mouthwatering and offer a great range for those wanting to stick to a well-known safe option, or for those wanting to try something new and different. The desert menu is also divine, my own personal option being the chocolate and caramel fondant. There are fruitier options available for those who prefer. All tastes are well catered for. If cocktails are more your thing, you'll feel at home at Circus where you can indulge in popular cocktails, some with a modern twist. Margaritas made with hibiscus juice and agave nectar just one of many examples. So whether you're hungry for entertainment, food, drinks or a party, it seems Circus is the place to be. Somehow, despite being a little bit of everything, Circus gets everything just right. Set in the heart of the busy, buzzy Covent Garden, it offers a cocktail bar, cabaret restaurant and even a nightclub at the weekends, where it plays host to various DJs, often resulting in party goers dancing on the tables. It is an elaborate venue to thrill even the toughest of an audience. The chic furniture, black and gold décor and bright lighting as you enter shows you that you are here for something different to the norm, how different, I'm not sure you can be prepared for, but I mean that in the best way. Enjoy your visit and the experience.